This scientific calculator performs complex arithmetic calculations. 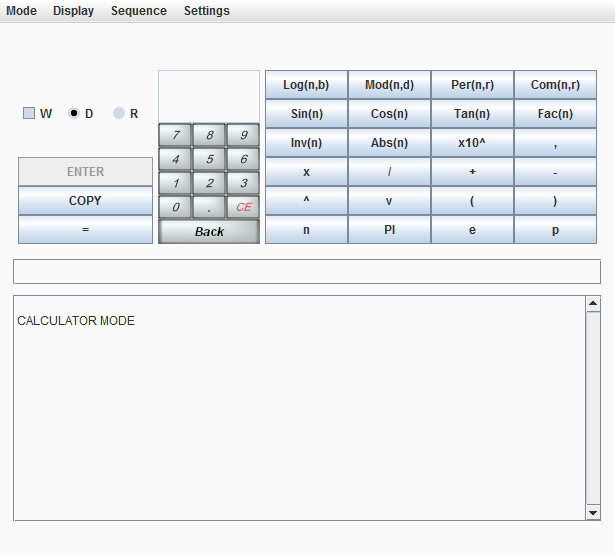 You can use the button panel on the right of the calculator to build arithmetic formulas including nested formulas. Brackets can be used to separate important elements. Type your scientific expression into the input field just above the display box. In addition to arithmetic calculations, the calculator also supports a statistics mode to return the elements (mode, median, max, min etc.) of supplied data. Numbers can easily be expressed using exponents. » Please note that this application requires Java to be installed. » Java must also be enabled to run inside your browser. » If using Google Chrome launch as Java Web Start.